Every once in a while I like to introduce some Japanese product that I've fallen in love with. Miso soup is something I enjoy adding to a meal... but not enough to pull out a pot and make it from scratch every day. 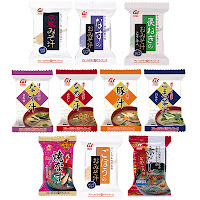 And although there are many, many brands that put out single-serving packets of miso soup, it took me a really long time to find one that I thought tasted really good. But, compared to non-freeze-dried competitors, the price on these items is a bit expensive. In local supermarkets, the soup packets run about 120 yen per packet. But if you try a couple and like them as much as I do, you might want to order the soup online instead of buying locally. On the official Amano Foods online shop, you can get any flavor they make in a box of ten (starting around 1100 yen per box, or 10 of a smaller, "ひとくち" mini-sized cube for 900 yen). You can also mix and match 10 flavors you want into one box at a bit more cost. They're also a super-light choice for camping trips. Although they are bulkier than raw miso types, thanks to zero water weight, the soup cubes weigh just 10 grams each. 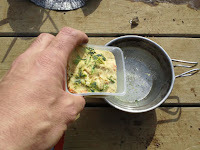 In addition to miso soup, Amano also makes freeze dried curries, noodles, donburi, and ochazuke packets. These run about 20 grams and 300 yen each (on the official site). For the best prices, though, check out Amazon. They offer almost as wide a selection as Amano's official site, including my personal favorites: aubergine, green onion, and butajiru (pork and miso soup). The other perk of Amazon is its free shipping, even on a single box. Amano's official site will charge 500 yen for shipping unless you order at least 5,000 yen worth of product, although thanks to the freeze drying, the shelf life on these products won't pose a problem if you decide to stock up.